This being St George’s day, and unusually we bothered to make an effort. 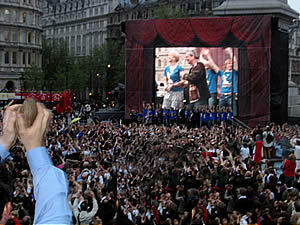 Thanks to Spamalot, in Trafalgar Square, we broke the world record for the most people playing in a coconut orchestra. At 5567, quite a few more than New York’s previous record of 1785. It would have been much higher, but we ran out of coconuts. Pythons Terry Gilliam and Terry Jones made an appearance. 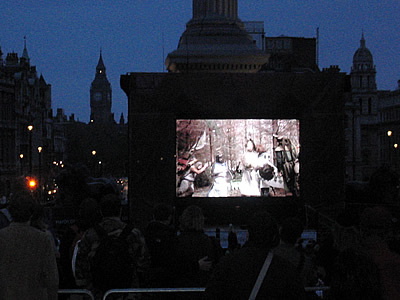 Following the record attempt there was the slightly surreal (but strangely appropriate) screening of Monty Python And The Holy Grail at the foot of Nelson’s column. Big Ben on the skyline. The 5,000+ audience still equipped with coconuts joining in wherever a clip and clop might be required. Back to computing stuff next. 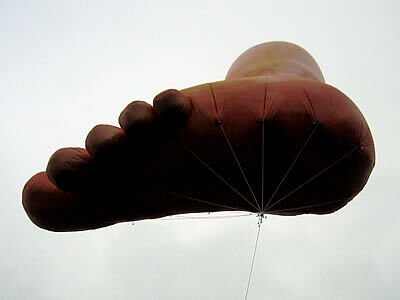 This entry was posted on Monday, April 23rd, 2007 at 11:25 pm and is filed under holy grail, unusual london. You can follow any responses to this entry through the RSS 2.0 feed. You can leave a response, or trackback from your own site.